Recombinant Bovine interleukin-21 (PBP028) detected using Rabbit anti Bovine interleukin-21 (AHP2379) as the capture reagent and Rabbit anti Bovine interleukin-21:Biotin (AHP2379B) as the detection reagent followed by Streptavidin:HRP. Rabbit anti Bovine interleukin-21 antibody recognizes bovine interleukin-21 (IL-21), a 16.95 kDa cytokine belonging to the IL-15/IL-21 family. IL-21 is a cytokine with immunoregulatory activity. IL-21 stimulates B- and T-cell proliferation and increases the activity of NK cells and disease-specific cytotoxic T-cells. Interleukin-21 is believed to inhibit dendritic cell activation and maturation during the T-cell mediated immune response. Antisera to bovine interleukin-21 were raised by repeated immunisation of rabbits with highly purified antigen. Purified IgG was prepared from whole serum by affinity chromatography. This product may be used as a detection antibody in a sandwich ELISA together with AHP2379 as the capture reagent. Recombinant bovine interleukin-21 (PBP028) may be used as a standard. This product may be used as a capture antibody in a sandwich ELISA together with AHP2379B as the detection reagent. 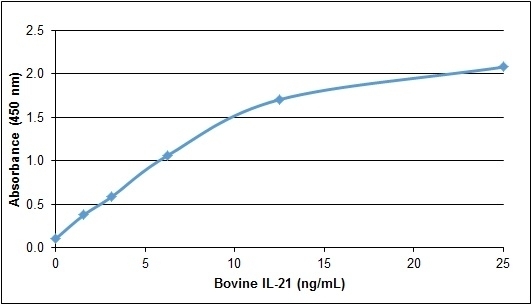 Recombinant bovine interleukin-21 (PBP028) may be used as a standard.